One of the most common causes of plumbing problems in the average household is drainage. 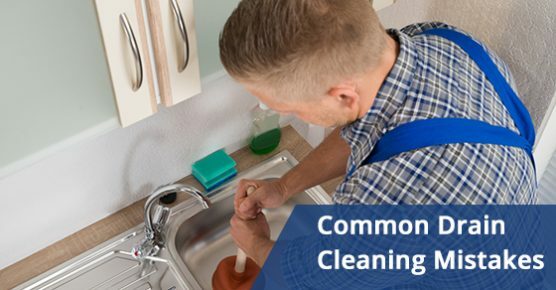 Clogged drains are certainly common, but that does not mean that the occurrence is not a massive inconvenience. The good news is that most drain issues can be solved with a few simple plumbing solutions. Unfortunately, many people make the same mistakes when doing so. Take a look below. It can be very tempting to try to deal with drainage clogs by finding or crafting something that can fit down the drain and then using that item to push down the drain in an attempt to unclog whatever is stuck inside of it. This, however, is not a good idea. It will typically result in pushing the clog down further and probably even making the clog more compact, dense and difficult to get rid of. Rather than relying on homemade devices, you should only use tools that are specifically created for unclogging drains. Putting anything else down the drain is most likely only going to exacerbate the problem. Chemicals are often used to unclog drains. However, if the wrong chemicals are used, or if the chemicals are overused, this can lead to them causing more damage in your drains than they fix. Many of these chemicals will work to dissolve the clog, but this very means of unclogging the drain can also cause problems by eating away at the drains themselves. The key here is that not all drain cleaners are created equal. Some are unsafe and can actually cause more plumbing issues by eating away at your pipes. The only safe drain cleaner that Advanced Plumbing recommends is this bio drain cleaner, which is not sold in stores. Another common mistake is simple negligence. Drains should be checked regularly for functionality. If you wait until there is a problem to check your drains, then it will be too late. Drains should be monitored regularly for flow issues and dealt with as soon as there is any sign of an issue. This will prevent larger problems in the long run. Most people can’t expect to look after their drains entirely on their own and have the results turn out as favourably as if they had turned to professionals for help. It is often recommended to book an annual inspection with a trusted plumber in order to make sure your drains are functioning properly. Similarly, if the problem is too big, don’t take it on yourself: contact a professional. If you are in need of professional plumbing services or bio drain cleaner, call Advanced Plumbing at 877-286-8044 or contact us online here. We’re the plumbing experts. Advanced Plumbing offers efficient plumbing solutions, upfront pricing and 99.9% customer satisfaction.